Jeff is on His 5th Houston Investment Property in 6 Months! Jeff is on His 5th Houston Investment Property in 6 Months! Jeff is On His 5th Deal in Six Months! When this property showed up in Jeff’s inbox, he knew it was a “killer deal.” Since the Houston investment property was in his neighborhood, he was familiar with property and rent prices. He knew right away there was a lot of equity in the deal. Jeff ran the numbers and had them verified by two external sources. And before the rehab was completed, Jeff already had a signed lease for renters to move in! Not only is Jeff benefiting financially from real estate investing, his full-time corporate sales career has improved as well. He is a more efficient worker so that he has more time for investing. Jeff has big plans for the future of his real estate investing business. He is interested in accumulating buy and holds to build an income stream, but is also seeking bigger deals. Jeff plans to diversify his investments with commercial deals and apartment complexes. We recently sat with Jeff to learn more about the deal he found on MyHouseDeals, how he got started in real estate, and how he’s already on his 5th deal in six months! A quick tip to rent out your property. How to resolve title issues at the beginning of a deal. How to effectively use hard money for a deal. NOTE: Since Jeff is a Premium Elite member, he received a FULL refund of his up-front membership fee for simply doing a deal! Find out more about our Premium Elite membership here. What motivated you to become a real estate investor? That goes back a long time. I just have always wanted to be involved in it, and then I’ve just been doing a lot of research in order to create a successful model using some knowledge that I’ve learned in corporate America. 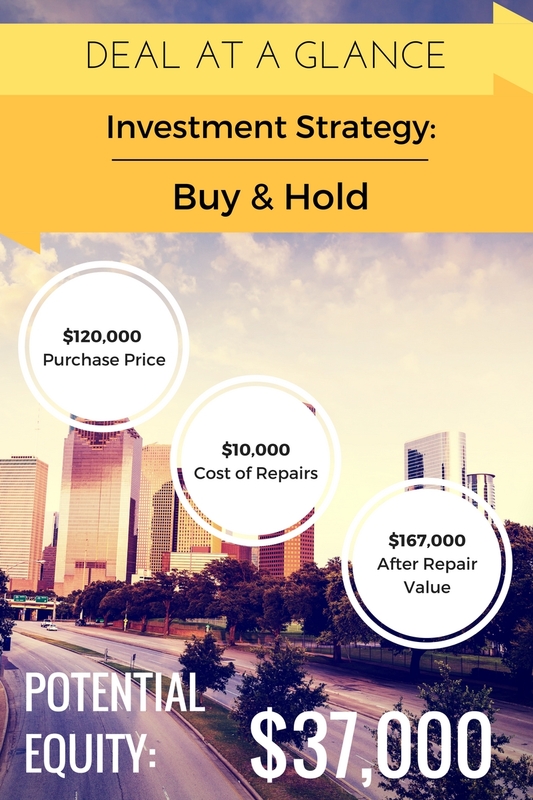 How did you find your first Houston investment property? My first property was actually my former home so I just kept that and rented it out when we moved. What steps did you take to do your next deal? Then I started really looking into doing another deal. I had so much equity in my first house at approximately 50% which equated to about $80,000 in equity. I wanted to buy the best deal and I wanted to do rentals. I like monthly cash flow. I did a weekend class, and then I got introduced to apartments and they mentioned the term wholesale, so then I just started networking in all of these different events throughout the course of the next six months. Learning and reading books and just meeting as many people as I could and picking their brains. I got turned on to my next deal through wholesalers. 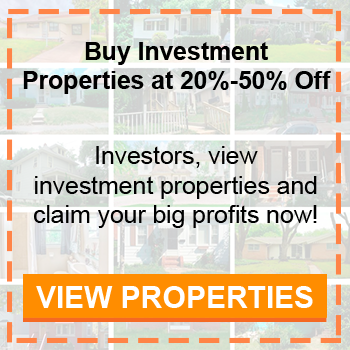 I wholesaled a property, got some cash, and then I found MyHouseDeals which only advertised off-market deals. That’s what brought me to this property. Has your life changed since you started investing in real estate? In my career, yes. I’m all about completing things a lot faster. The quicker I complete it, the faster I can get to my real estate. It’s made me much sharper. When you’re dealing in real estate it’s your own money. So you start to really look at things whereas working for a company you’re not really working with your own money. I look at the profitability of things for my company and I’m able to speak to any level management much crisper. What kind of deal were you looking for on MyHouseDeals? Actually this one just popped out at me. I get the daily emails of new deals. When I saw it I was working from my home office that day. The property was in my neighborhood and the amount of repairs was minimal. I looked at the pictures and I saw the price. I know the price in my mind and I knew it was a killer deal because I know the rent and I know the prices. I knew just on what he was offering I was capturing a lot of equity. Low repairs, no repairs, easy rent-able market which is where I am and it’s nearby my house. How did you finance this Houston investment property? Would you recommend this strategy? I used hard money. If it works out for you then I recommend it. First I saw it was a good equity capture deal as well as a monthly escrow. I called my hard money guy and I asked him to verify. This is what I see on numbers. Can you confirm them and just on the phone he confirmed and he said yeah, this is a really good one. This is 33% cash-on-cash. I had him tell me what I could come out of pocket with and then what the monthly note would be and on his time. Then I called my long-term lender and had him confirm that I could get out of the hard money and quickly without lease so that I wouldn’t need to have a lease just in case I couldn’t rent it quickly. He’s done several deeds for me just in the past six months. We have a rapport. I had him confirm what he thinks the monthly note would be all in, so everything checked out. I trusted my numbers. I called my guy and a long term money guy verified. Trust the verify. I do recommend hard money. If I had gone conventional I would have had to come out of pocket with $35,000. I reduced my cash out of pocket by about 40% so I still have a lot of cash in my reserves, I got the property, and I kept all of this equity. It’s crazy. What advice do you have for expediting any potential title issues? Clear it up. I know on my side I could have verified a lot of the probate issues on the front side: Who needed to be at closing, what affidavits needed to be signed as opposed to that being uncovered late. I let the buyer know everything that was going on. I also noticed she called the title companies. Sellers are always going to tell you nothing’s wrong with the title. What do you want your real estate business to look like 10 years from now? Multi-faceted. Commercial, residential, holding with rentals or leases, as well as purchase and sale on both the residential and the commercial side. Really a truly multi-faceted organization. How to do you plan to get started? It will start by getting my first commercial deal. I was negotiating on a 36-unit apartment complex, and really getting in with the commercial guys and understanding how commercial financing works. I believe it all depends on the commercial finance side. If you can put that together then you can really pull off anything. Then, obviously, marketing correctly. If I’m able to market and get directly to the buyers and have people who market and get directly to the buyers and bring these deals to me I can finance them or I can sell them. I want to build a team. It is very audacious and aggressive, but it’ll be a cool deal if I’m able to pull it off. Do you have any advice for newer investors who are trying to get started? Just do it. Seriously. I waited a long time. I’m working on my fifth deal literally since February. Once you get the first one done, you realize you can get renters in easily. They’re begging to rent. I got this place rented, I just got the lease and deposit last week. It’s not even finished. It’s not even clean. I still have a car in the garage. Very, very easy and you won’t believe it until you’re doing it. Do not be afraid to step into a deal and then just make your money.